It’s no secret that New York City is considered to be the center of the universe. It’s a pulsing and vivid place with lots of things to see, do and enjoy every day. Don’t know what to do in NYC? Have a look at our list of the city’s best places and attractions. A masterpiece of Art Deco design, Empire State Building is located in the very center of Midtown Manhattan. Its 86th and 102nd floor observatories offer the greatest view of NYC and its famous landmarks from the height of 1,000 feet. The Empire State Building is open 365 days a year. It’s better to take the audio tour and find out about everything you see. Don’t miss your chance to see not only the five NYC boroughs, but also five neighboring states. Designed by Frédéric Auguste Bartholdi and built by Gustave Eiffel, the copper Statue of Liberty is a symbol of freedom and democracy. It was a gift from the people of France to the people of the United States. The total height of the statue is 305 feet, and its total weight is 450,000 pounds. The torch of the statue is covered with 24k of gold. To get to Liberty Island, take the ferry that departs from Battery Park. If you want to enjoy the view from the crown of the statue, remember that it is 377 steps away and there is no elevator access. You also need a ticket to get to both the crown and pedestrian. One of the most iconic structures of New York, the Brooklyn Bridge is not only as a commute from lower Manhattan to Brooklyn, but also a popular tourist destination. The oldest bridge in the United States was built in 1883. It stretches for a length of 5989 ft (1.8 km). The towers of the Bridge are 276 ft (84 meters) high. More than 120,000 vehicles and 4,000 pedestrians cross the Brooklyn Bridge every day. The bridge is available 24 hours a day, but the sunsets are especially breathtaking here. Since the bridge has a pedestrian walkway, you can have an amazing stroll and enjoy the views. Wondering what to do in New York today? The American Museum of Natural History (AMNH) is located on the Upper West Side of Manhattan. One of the largest museums in the world has 27 interconnected buildings with 45 exhibition halls. People of all ages come to the museum to see its 32 million specimens of plants, animals, fossils, humans, minerals, meteorites, rocks, and human cultural artifacts. Remember the Night at the Museum movie? AMNH will show you the cute dinosaur who liked to play so much, and also the Easter Island Head and the 94-foot blue whale. The American Museum of Natural History is extremely popular; more than five million people visit it every year. If you go to the museum with your kids, don’t forget to check out the Discovery Room. Founded in 1870, this museum is also known as the Met. It’s one of the world’s largest art museums. Its collection comprises more than two million works from various times and cultures. The Met exhibits the best things created by human creativity from all over the world. With its tall windows and columns, the museum looks like a palace. The variety of artwork presented here is pretty impressive: it has almost 3,000,000 works from every part of the world. You should definitely see the ancient Egyptian collection. There is this special department in it presenting the arms from Europe and Japan. The museum’s collection of Egyptian art has some works dated as late as 300,000 BC. Designed and built by Frank Lloyd Wright, the Solomon R. Guggenheim Museum, also known as The Guggenheim, is an art museum in the Upper East Side, Manhattan. The magnificent white spiral building stands out in the nearby architecture. When you walk inside, the first impression is the rising atrium with a glass dome. The Guggenheim offers an impressive collection of artworks from the 19th and 20th century, including the works by Calder, Brancusi, Robert Delaunay, Braque, Chagall, Giacometti, Kandinsky, Klee, Leger, Willem de Kooning, Picasso, and Van Gogh. Designed by Calvert Vaux and Frederick Law Olmsted, Central Park covers 843 acres in middle-upper Manhattan. It is 2.5 miles long and 0.5 miles wide. Did you know that it’s the most visited urban park in the United States? More than 40 million visitors come to see it every year. You can either take a guided tour through the park, or just discover the area yourself. There are great attractions for kids: the Central Park Zoo, the Central Park Carousel, the Water Exhibit at Belvedere Castle, and the boat riding around the Lake. You can engage yourself with any outdoor activity, such as bicycling, rollerblading, ice-skating, picnicking, and even attend yoga classes! By the way, have you ever thought of having your wedding ceremony amongst this magic greenery? Central Park is open to visitors all year. It is only closed 1am-6am. It’s also worth mentioning that you shouldn’t walk in the park alone at night. The National September 11 Memorial & Museum honors almost three thousands of people that were killed during the attacks on September 11, 2001. It was built on the former location of the twin towers. The museum offers the 110,000-square feet of exhibition space telling the story of how it happened. You will see nearly 3,000 portraits of men, women, and children killed in the attack. The museum exhibits the “Survivor’s Stairs”, or what is left from the staircase that helped hundreds of people and saved their lives. See the twin reflecting pools located in the place of the Twin Towers. By the way, admission to the 9/11 Memorial is free. Known as “The Crossroads of the World”, Times Square is an intersection in Midtown Manhattan. It’s famous for its theatres, Broadway shows and billboards. Times Square is one of the most visited landmarks in the world. Almost 40 million people visit this commercial intersection every year. It’s crowded with people from early morning to late night. You can also visit the Theater District to enjoy one of its Broadway shows. Times Square has a diverse selection of cuisines. It is also home to dozens of shops, music and comic clubs. Check out the following famous buildings: One Times Square, The Brill Building, Palace Theater and Lyceum Theatre. You can also go to ABS studios and see a broadcast of Good Morning America. Top Of The Rock. Observation Deck At The Rockefeller Center. The well-know Rockefeller Center comprises 19 buildings and covers the area of 22 acres (89,000 sq m). Located in the Midtown Manhattan, the center is another popular attraction you should definitely visit when wondering what to do in NYC. The Center is home to various events, such as the lighting of the Rockefeller Center Christmas Tree. This event is broadcasted live on TV. It also locates Radio City Music Hall, the largest indoor theater in the United States. 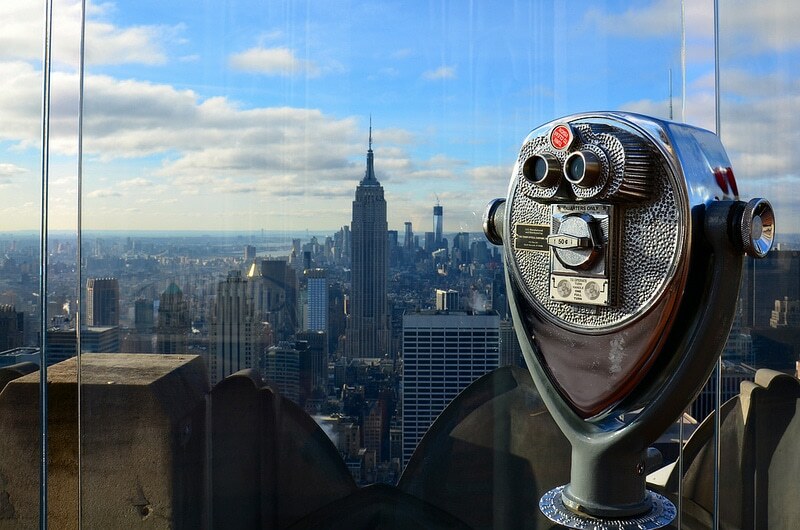 The top of the Rock Observation Deck will let you enjoy the spectacular 360-deggee view of New York City, including the entire Central Park in full view. It is open daily from 8 am till midnight. Still wondering what to do? 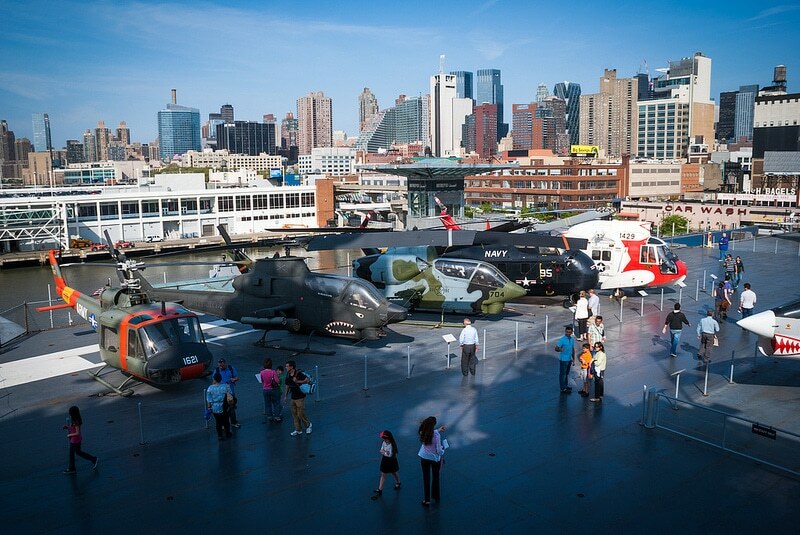 Go to the Intrepid Sea, Air & Space Museum that will tell you about the military and maritime history. It is centered on the aircraft carrier Intrepid. The museum tries to promote our awareness of history and science through the restored military aircraft and interactive exhibits. Use your chance to see more than 20 aircrafts. The museum structure implies spending quite a lot of time outdoors, so dress for the weather. To get the full experience, you may spend there up to three hours. Yankee Stadium is used mainly for baseball. Even if you are not into this kind of sports, go there and experience the atmosphere and the offered eating options. The latter include Brother Jimmy’s BBQ and Lobel’s Steak Sandwiches, as well as chicken & waffles, Cuban food, and sushi. The Stadium also offers great restaurants, such as Mohegan Sun Sports Bar and Legends Suites, Hard Rock Cafe, NYY Steaks and the Audi Club. Looking for some adrenaline? Have a ride at the Coney Island wooden roller coaster that was built in 1927. It’s a must visit destination for everyone in NYC. You will scream your head off during the ride, but it’s totally worth it. Don’t have the guts to do this? You can simply watch and listen to the screams of the poor people sitting in the roller coaster. St. Patrick’s Cathedral is a Roman Catholic Cathedral church of Neo-Gothic Style. It is one of New York’s most treasured and sacred landmarks. It’s located at the corner of 5th Avenue and 50th St, across from Rockefeller Center. St. Patrick’s Cathedral holds mass every day, 7 times a day. Find time to attend it and enjoy the unique experience and magnificent architecture. Did you know that the Cathedral’s bells have names? Some of them are Alphonsus, Agnes, Helena, and Godfrey. The biggest bell weighs 6,608 pounds. It is also a common tourist destination: 5 million people come here every year. The Cathedral is open daily from 6:30am to 8:45pm. In case you’re tired of sightseeing, relax in one of New York’s Jazz clubs: Cornelia Street Cafe, Dizzy’s Club Coca Cola, The 55 Bar, Smalls, Jazz Standard, Terra Blues, and many others. Fond of Italian Cuisine? Check out Del Posto, Al Di La, All’onda, Carbone, Gottino, Maialino, Marta, Osteria Morini. The popular Greek places are Kiki’s, Periyali, Kefi, Pylos, Yefsi, and Souvlaki. For those in love with Japan cuisine, we would recommend Sushi Yasuda, Sasabune, 15 East, Brushstroke, and Sushi Seki. Amaze your senses! That’s our list of things to do in New York? Do you know any special places that we have missed?